Add all the ingredients except the 1 tablespoon cinnamon (only add 1 teaspoon cinnamon at this point) to a blender, NutriBullet, or food processor. (If you're using plain vanilla protein powder, add 1 teaspoon additional cinnamon.) Process until smooth. 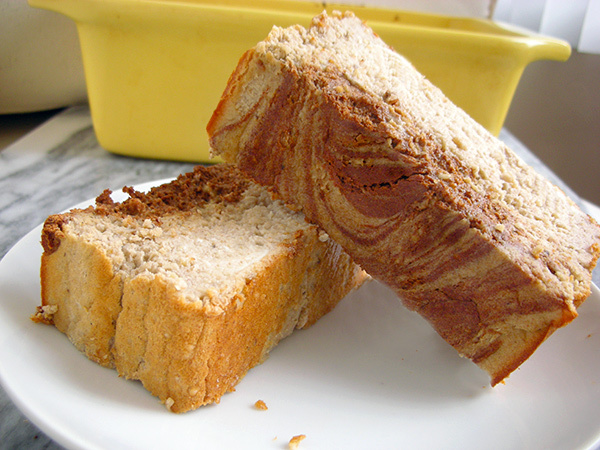 Spray a loaf pan with coconut oil. If you don't have coconut oil spray, melt a teaspoon or so of coconut oil, dip a paper towel in it, and wipe on the bottom and sides of the loaf pan. You can also use regular nonstick spray. Pour the batter into the pan. Scoop 1/4 cup of the batter back out of the pan and place it in a small bowl. Add the remaining tablespoon cinnamon and stir well. Dollop the cinnamon batter mixture onto the top of the regular batter. Swirl using a spatula or spoon. Be careful not to over-swirl, as you'll lose the pretty effect. Bake for 30-35 minutes, until edges are brown and a toothpick inserted in the center comes out mostly clean. Allow to cool and then slice into 6 pieces.